Mitt Romney promises to pay for his $5 trillion in proposed tax cuts so they don't add to deficits -- and would do so in large part by curbing tax breaks on the rich. He also has promised not to raise taxes on the middle class. 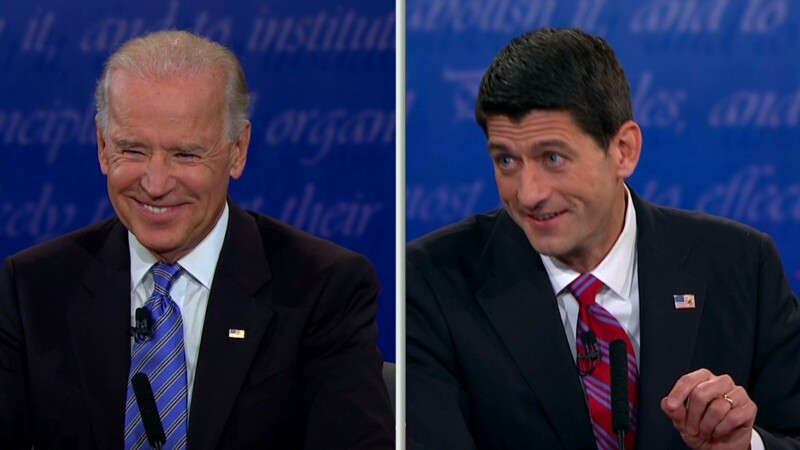 "Not mathematically possible," Vice President Joe Biden said during the vice presidential debate on Thursday. Romney's plan would give a big tax cut to the wealthy and hike taxes $2,000 for middle-income folks with kids, Biden added. Paul Ryan, Romney's running mate, shot back: "It is mathematically possible." The country forgoes about $1.1 trillion in tax breaks a year, Ryan said. "Deny those loopholes and deductions to higher-income taxpayers so that more of their income is taxed, so we can lower tax rates across the board." That's what the two sides are saying. The reality is far more complicated. Where does the $5 trillion come from? Romney wants to cut everyone's income tax rates by 20%, slash the corporate tax rate even more, repeal the Alternative Minimum Tax and make investments tax-free for those making less than $100,000 ($200,000 if married). Those numbers are relative to how much revenue the country would raise if the Bush tax cuts, which expire at the end of the year, are extended. How much money could Romney raise by curbing tax breaks? It depends which ones he trims and how he does it. Romney has spoken of some "options." Among them, capping itemized deductions. He's suggested anywhere from $17,000 to $50,000 for a cap. But capping itemized deductions alone won't come close to paying for $5 trillion in tax cuts. All told, people who itemized last year saved $147 billion without being restricted by a cap. Another reason: Some of the most expensive tax breaks are not itemized deductions. The Romney campaign told CNNMoney that a deduction cap would be just one part of a broader strategy to curb tax breaks. Other elements would include limits on personal exemptions and the tax-free benefit workers get when employers pay for their health insurance. That last one is often the biggest tax break in any given year. In 2014, it will reduce federal revenue by an estimated $164 billion, according to the Congressional Research Service. But Romney has flatly ruled out curbing some other big tax breaks. One example is the low capital gains rate, which disproportionately benefits the rich. That tax break is forecast to cost $71 billion in 2014. Tax and budget experts note that it's possible to pay for lower rates without hurting the middle class, but only if one is willing to put all the tax breaks that affect higher income households on the table. Would the middle class face a $2,000 tax hike under Romney? Without more specifics, it's impossible to say how Romney's plan would affect the middle class. The $2,000 tax hike assertion that Biden made comes from a Tax Policy Center estimate based on certain assumptions about how tax breaks would be curbed. Specifically, if tax breaks were reduced across-the-board by 58% for households making less than $200,000, and are eliminated entirely for anyone making more than that, then taxpayers with children making less than $200,000 would pay, on average, $2,000 more in taxes. But, as the Tax Policy Center and others that dispute its estimates have pointed out, different assumptions can lead to a different conclusion. Can't economic growth help pay for the tax cuts? Yes, but it's impossible to know by how much. For one thing, it matters how quickly one assumes the economy will grow. And tax reform is just one element that can affect the economy. There's no guarantee others might not be working against it when reform is implemented.